Although National Kite Month took place in April, as long as the wind is blowing and the sun is shining, it’s always a great day to fly a kite. Every time I think about loading up the kids for this activity, I immediately think of “Mary Poppins,” one of my all-time favorite movies. The iconic “Let’s Go Fly a Kite” musical number at the end, where the father realizes that his children are more important than his work, has enough love and happiness to make anyone want to send a kite soaring. There are more types of kites available than you might think, but for beginners, you really only need to worry about two: the delta (triangle shaped) and the diamond (see the DIY instructions that follow). Both are simple to assemble and fairly easy to fly. manage once they’re in the air but might require a little more patience to get started. Most people assume that the breezier the day, the better the kite flying, but that’s not necessarily true. It can be dangerous to fly a kite in overly gusty conditions. means you should see leaves and branches moving, but whole trees—even small ones—aren’t swaying yet. Remember that the wind you feel in your neighborhood is only a fraction of what it will be in a wide-open field. Never let your child fly a kite on a stormy, or even potentially stormy, day. Despite the example set by Benjamin Franklin, lightning mixed with kites is a recipe for disaster. Once you have a kite and a clear, beautiful day, flying is the easy part. Find a wide-open space at least the size of a soccer field, free from trees and power lines; an actual soccer field works just fine. With his back to the wind, have your child hold his kite out in front of him. 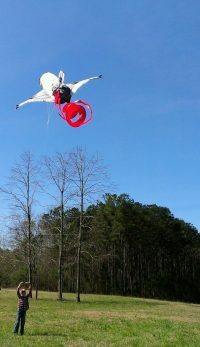 On more windy days, your kite will automatically catch the wind and practically fly itself. Have him slowly unravel the line to give the kite more altitude and watch it soar. To bring it back down again, slowly wind the line back in. If the wind isn’t quite that strong, your kite might need a little help getting up in the air. Have your child hold the line while you walk the kite about 50 feet away, keeping the line taut. When your child says “Launch!” throw the kite straight up while he quickly pulls the line in, hand over hand. This will create the wind you need, much like running, but with a little more stability. As the kite gains altitude, let the line back out. If you are still having trouble, have your child run with the kite and watch for any odd movements. If the kite is spinning or swaying, it may not be assembled correctly. Although not strenuous most of the time, kiting is quite a healthy activity! It’s good exercise for your eyes, focusing near and far at the same time. Breathe that fresh air and soak up some vitamin D, but don’t forget the sunscreen! You can even fit in a bit of moderate exercise sometimes as you walk or run while searching for faster air. a right angle to the vertical one. Tie the two sticks together by wrapping the string securely around the center points making a crossed pattern. After the sticks are secure, tie a knot with the string. Note: Do not cut the long end of the string yet! Wrap the long end of the string and secure it to the notch at the top of the vertical stick. Work your way around the kite, placing the string in the notched points. You will create a frame for the kite. Remember to keep the string taut and wrap it back to the center of the kite frame. Tie a knot again to secure the string. Lay the kite frame on top of your fabric or nylon and cut the fabric around the frame, allowing at least an extra 1-2 inches all the way around. bottom tips of the kite with extra glue. 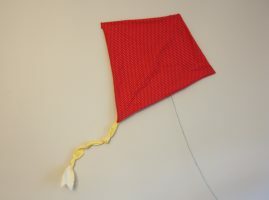 Use a hole punch or knitting needle to create holes at the top and bottom of the kite. Cut string and thread one end through the top hole and the other end through the bottom hole. Secure both ends with a knot. This string is the kite’s bridle. Tie the end of the flying string to the bridle— about 1/3 down from the top. Attach additional string to the bottom hole and tie cloth bows or ribbons for the kite tail. To see more detailed photos of this craft, visit pwliving.com and look under Family Fun. 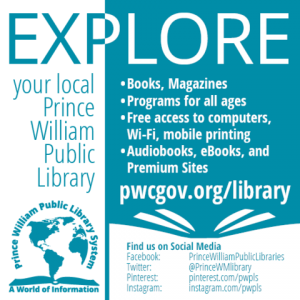 Amanda Causey Baity ([email protected]), Prince William Living’s director of operations and photo editor, also blogs about thrifty family activities on her blog GreenOwlCrafts.com.